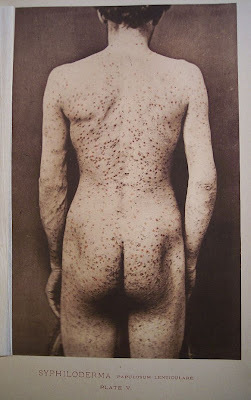 From an 1881 textbook (Photographic Illustrations of Cutaneous Syphilis, by George Henry Fox). currently listed at eBay. The Buy-It-Now price for the book is $1,950. 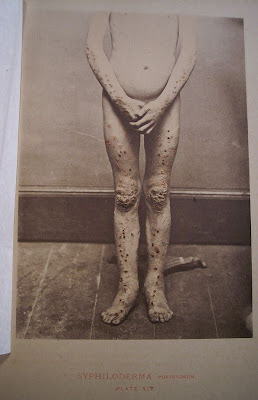 Note: the eBay listing has numerous additional photos, many of which are clinical and explicit. 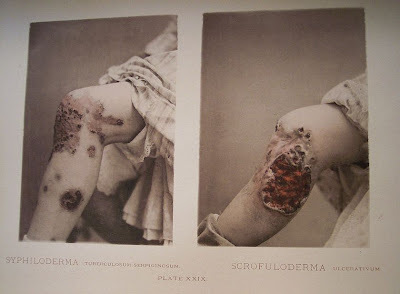 It reminds me of this website, which has about a hundred pictures of Jules Baretta's ultra-realistic wax models of common 19th century diseases affecting skin, such as syphilis: http://www.bium.univ-paris5.fr/sfhd/musee/image01.htm. Click on "image suivante" to see the images. 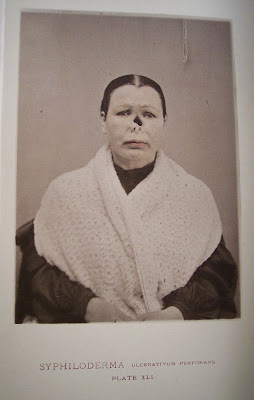 Thanks for this post, just gave the spurr I needed to write about Jules Baretta. Thanks for the link. I'm glad I managed to put up that post about Baretta. Thanks!